Germaine and I are still knee deep in home improvement projects but we are falling in love with what we’ve done to the back and front yard so far. If you remember my post from a few weeks ago, we completed some major overhauling to the yard including building a concrete patio, raised vegetable boxes and landscaping. Today I’m going to give you a backyard renovation sneak peek showing how everything looks now that the sod has been watered and some of the plants are maturing. The plant above is right below our deck in a flower bed created to provide something visually pleasing to look at when looking down from our 12 foot high deck. In that same flower bed I planted two rose bushes, one of which is finally producing leaves. The grill patio is one of our favorite parts of the backyard now. We grilled out Memorial Day weekend and enjoyed using it even without the grill gazebo we plan to buy soon. Not to far from our grill area is our vegetable garden which has grown even more from when I took the picture below. 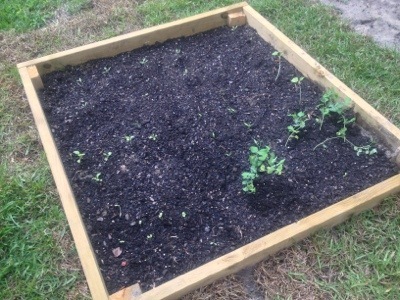 We plan to install a total of four vegetable boxes this year. Some of the smaller projects have been touch up painting. 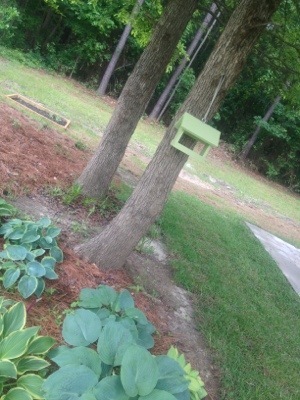 I repainted the bird feeder Germaine Jr. made me a few years ago. I love the way it looks hanging in the tree above my shade garden. We are going to build a small patio in this area and set up a three piece bistro set for Germaine and I in the back half of the shade garden. From this picture you get a feel for how things are situated. The grill patio is on the fare right, the shade garden in the center of the photo, the patio will be built behind the shade garden where there’s currently pine needles and right behind the patio area is where the four vegetable boxes will be. The whole back half of the yard starting at the vegetable box needs to be sodded but it’s gotten to hot to do anymore now so we’ll wait until the weather is milder in the fall. The sun here is so intense it would decrease the chances of the grass surviving unless I watered it twice a day which I don’t plan on doing all summer. Which is why I love the centipede grass we chose. Once it’s established it does not need much watering but to get it established in this South Carolina heat you must keep it wet. Finally, my Hostas are the joy of my garden. 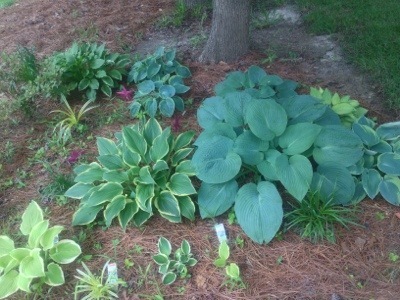 Hostas are so easy to grow and easy to divide. Plants that can be divided mean less money out of pocket if you are trying to establish a garden on a budget. Plants are not cheap so I’ve been dividing them for a few years now and they are starting to fill in the space. 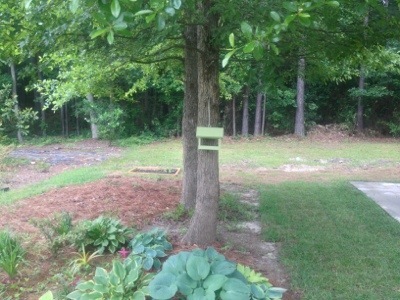 The goal is to have them fill this area until there’s no longer a need for pine needles. We are learning a lot about our yard, our likes and dislikes and our own abilities to do more on our own than we expected. We have several more projects in the works including building an under-deck patio, installing under deck roofing, and building outdoor table for the deck. Shh!..Germaine doesn’t know about the table yet. I try not to overwhelm him all at once with my ideas. If you are considering some DIY projects, I really hope this post inspired you to give them a shot.